Give me an S, give me a K, give me an I, give me a R, give me a T. Give me an A line skirt. Let’s talk A line skirt shall we? Why is that a subject? There are not thaaat many girls wearing them are they? Well not… yet! Because recently the A listed skirts (that was better was it? Damn should have started with that one) were the bodycon skirt and the skater skirt. 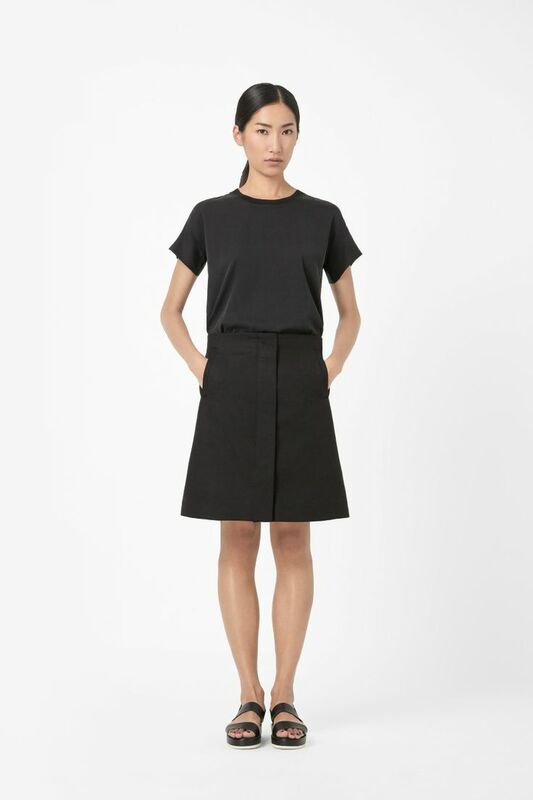 Either in short or midi length version (aka pencil skirt and new look skirt). But in last winter collections a sixties swing blew on fashion and the A-line mini skirts made a come-back. Sometimes I am not soooo sure about come-backs (don’t take it for you long skorts. Even though, well, I was kind of targeting you). But this one definitely is a keeper. Before explaining how to wear that item I want to say that this skirt has quite a youthful look if you indeed wear it as a mini (mid-tights) Think Twiggy or young Jane Birkin. Therefore, if you feel you past the age, choose them in a longuer version (just above the knee like Lou Doillon in the following picture). Make sure the “A” is not too large otherwise you could look “mumsy”. And prefer to wear it with heels. I- What is an A-line mini skirt again? A- How much A is the A line? It can go from very barely noticeable A to obvious A. Personally I prefer the slight A as it gives a slender and more energetic allure. Very structured A-line skirts can be very graphic and make a statement look but beware, if poorly chosen, they’ll make you look dowdy (pardon madame). No because if it has flounces then it is a skater skirt. And yes it can have one or two box pleats. But no more because otherwise that is a pleated skirt. Remember that the shape has to remain very minimal, just like letter A. If you have hips, stay away from the pleats. And never choose the skirt too tight, that would set the focus on your hips. C. Does it have to be high waisted? No it does not. But if you are going for the mini, it’d better be, otherwise you are not going to have lots of fabric on you. Plus, generally, it is much more flattering because the A follows the shape of the hips rather than being disconnected from them. Suede, jeans, wool, leather, thick cotton, anything but jersey (cause the lack of stiffness will not make the A shape work). II- How to wear it? A- To tuck or not to tuck in? The tucking in is a very stylish option cause it really shows the A shape of the skirt. It will make you look effortlessly chic. – you have a noticeable belly (I am not talking about the little belly that most women have, of course). If you are going to tuck in, choose a thin fabric that won’t show underneath. You can go for a loose fabric that will contrast with the structure of the skirt. If you prefer not not tuck, you can go either for something loose that’ll fall on the hips or for a structured top with an A-line shape to make an overall “baby doll” A line shape effect (do not find any pics for that last one, try it home and send me the look please ^^). If am not a fan of structured jackets on top of A-line skirts. I think it makes you look kind of square most of the times. Even though straight jackets is what Courrèges was pairing with the A-line skirts in the sixties (in a successful way). You can make it work if your jacket is slightly A line as well or if it is very short. Nowadays, I prefer to use longer coats. Either straight or belted. This helped me understand skirts in my wardrobe so much better! Thank you!